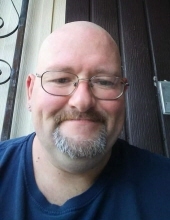 Randy Allen Welch, age 42, of Howard City, passed away Friday, March 30, 2019. He was born May 11, 1976 to Beth Ellen Welch and Albert Lee Bellamy in Grand Rapids. Randy enjoyed being with people, watching movies with friends, fishing and cooking. He had a special way with and interest in animals and animals trusted him. Randy also enjoyed his special canine friend Scooter. He is survived by his mother, Beth; brother, Franklin (Sarajane Eley) Welch; uncles and aunts, Kay Felde, Alfred (Cathy) Welch Jr., Robert (Lera) Welch; cousins, Traci Archer, Angela Welch; special niece, Gabby; special friend/brother, Robert Mitchell; many cousins, nieces, nephews and many more. Randy was preceded in death by his grandfather, Alfred Welch Sr.; grandmother, Maxine Welch Michels; step-grandfather, Howard Michels; uncles and aunts, Elaine Welch, Vera Giffen, Arlene Welch, Kathy S. Welch, Linda Cook, Mark Allen Welch; cousins, Arron Yaw, and Christopher Archer; brother/cousin, Larry Jo Cook. The funeral service for Randy will be 2:00 pm Tuesday, April 2, 2019 at Fields McKinley Funeral and Cremation Services, 45 E. Main St, Grant, MI 49327. There will be a time of visitation with the family one hour prior to the service. To send flowers or a remembrance gift to the family of Randy Allen Welch, please visit our Tribute Store. Or, if you would like to donate to the family, please visit Randy's Tribute Fund. Help ease the financial burden placed on the Welch Family after the loss of a loved one by making a donation. "Email Address" would like to share the life celebration of Randy Allen Welch. Click on the "link" to go to share a favorite memory or leave a condolence message for the family. Provide comfort by sending fresh flowers from our local florist or donating to Randy's Tribute Fund.